FIFA 15 features the Manager Career Mode which is possibly one of the oldest game types in FIFA - dating back to when it was just considered 'Career Mode'. Manager Career mode allows you to control a team both in games and in the transfer and team management side of being a professional football manager. You can scout for players, transfer and trade players, compete in games and tournaments, and communicate with your board and coaching staff. A new feature in FIFA 15 is the 'Global Transfer Network' that will allow you to scout out the upcoming young football stars around the world. 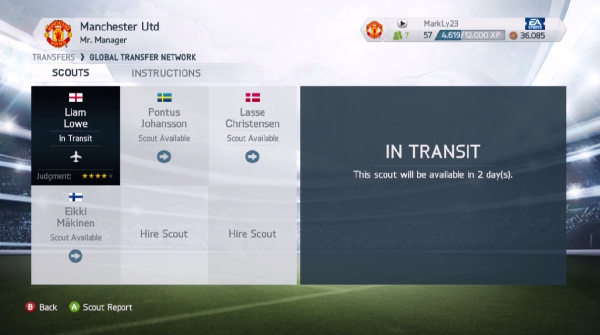 In FIFA 15, you can send out any of your possibly 6 scouts to any region of the world to look for players. You're going to want to match certain scouts to regions where they are knowledgeable, and send only your best scouts to regions you feel are most potential. You can use the Transfer market to buy or sell players. You can theoretically ask to buy any player from around the world, but the problem is that you may not always be successful in your bids, no matter how much you offer. Certain players have attachments to their clubs. While it is not impossible to buy any one player, it may cost a lot moreo to pry them from their current club. You can also consider selling your own players if necessary. In fact, it is often a good idea to put up a few players who you don't have much use for in order to fund other transfers. A big squad isn't always all that necessary in FIFA 15 Manager Career. Also pay attention to the contracts of your players. You need to renew contracts if you want to keep a player, and a larger contract will deter other bids and make it more likely that you can keep your best players. If a player is getting to the end of his contract and you cannot afford to keep him, then definitely try putting him up on the Transfer Market to avoid him going away for free. By playing games and performing well, your team's players will improve over time. This is especially true of young players or players you pick up from Scouting as they have not yet reached their peak and have a long time to improve. If you play the scouting game right, you can make a profit by developing these young players and selling them later on.